William Gordon was the laird of Earlstoun Castle in Galloway. He was heading to the Battle of Bothwell Bridge to join the Covenanters when a party of dragoons came upon him. He was shot near to Crookedstane farm, near Quarter (NS 724498) on 22 June 1679, aged 65. He had previously been fined and banished abroad for his Covenanting sympathies. 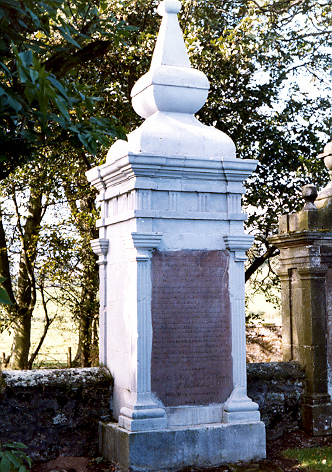 The large memorial to Gordon is locate din the kirkyard at Glassford. The stone was uninscribed until 1772. The Scottish Covenanter Memorials Association planted an oak tree, taken from the woods at Earlstoun Castle, next to the grave.